our driver named wanyan,he is such a good driver ,he reached our villa at 7am sharp, since we are travelling with toddlers,he is very considerate help us entertain our kids,dont mind stoping for food, he ensure we managed to visit and enjoy all d places and also avoid being stuck in the traffic..along d way he explained and tell us more about bali culture and lifestyle..n the view for the waterfall is just ahmazing! Waiting for the next nature adventure? Ready your travel essentials, grab your best travel buddies, and make your sweet escape to Bali! Discover the island of the gods’ treasure trove of natural wonders as you visit its breathtaking waterfalls, dense jungle, and stunning rice terraces on a full day tour. Start your tour with a visit to 2 of the island’s scenic waterfalls, the Tibumana Waterfall, a hidden gem in the forest, and the Tukad Cepung Waterfall, a short adventure through a jungle, river, and a cave - a trip to these secluded areas will definitely bring out the adventure seeker in you! 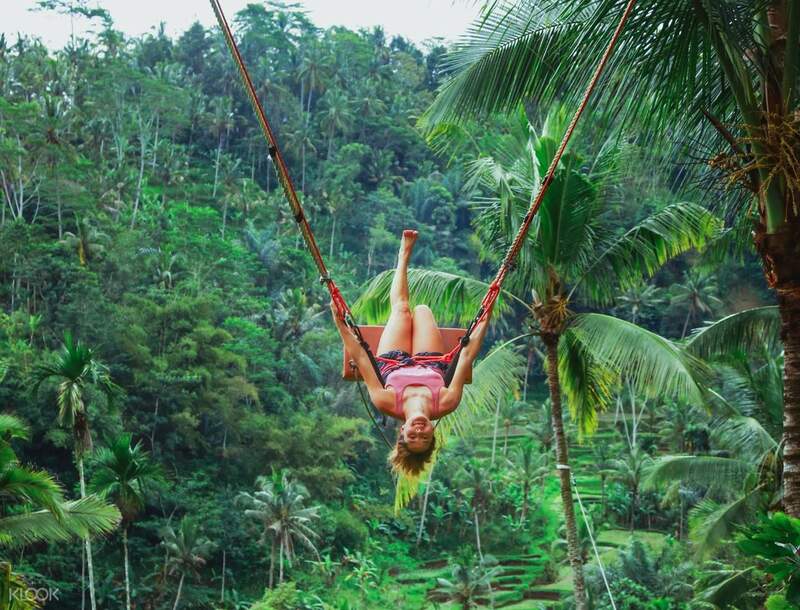 Savor the rich taste of Bali’s local coffee and herbal tea before heading over to the famous Ubud Jungle Swing to strike your fiercest Instragam-worthy poses with a picturesque view of the jungle as a backdrop. After your fun photoshoot at Ubud, take a trip to Tegallang District where you will witness the grandeur of the Ceking Rice Terrace. You will learn the intricate processes behind how the locals of Bali grow their rice and how their ancient irrigation system is implemented in the the island. Cap off your exciting expedition with an exploratory walk around the beautiful rice terraces elaborately created by the locals. Have a hassle free whole day tour with round trip transfer services available in selected Bali areas for your ultimate convenience! The pick up time was punctual and our tour guide Eddy was very helpful throughout the trip! During the way to the waterfall, he has helped us to take a lot of nice photos along the way and gave us very good information of Bali. The private car was spectacularly clean and he driving skills are smooth and safe to ride in! The restaurant we had lunch at was very tranquil and the food was delicious. Would recommend this trip to every one. The pick up time was punctual and our tour guide Eddy was very helpful throughout the trip! During the way to the waterfall, he has helped us to take a lot of nice photos along the way and gave us very good information of Bali. The private car was spectacularly clean and he driving skills are smooth and safe to ride in! The restaurant we had lunch at was very tranquil and the food was delicious. Would recommend this trip to every one. Activity was exciting and fun! The thrill of swinging over the hills is exhilirating! Waterfalls are beautiful. A tad bit tiring as we need to climb up & down many stairs to access to the waterfalls but they are worth it. Activity was exciting and fun! The thrill of swinging over the hills is exhilirating! Waterfalls are beautiful. A tad bit tiring as we need to climb up & down many stairs to access to the waterfalls but they are worth it. One of the hidden gems in bali....these two waterfalls are located in path least taken and was very beautiful to visit...didn't want to leave the place and we wanted to go into water all the time...such wonderful sight!!! Along with this bali swing is best for Instagram click!!! The driver Agus was one of the best friendly person we met in bali and he took attention to detail on serving us..Thanks Agus! One of the hidden gems in bali....these two waterfalls are located in path least taken and was very beautiful to visit...didn't want to leave the place and we wanted to go into water all the time...such wonderful sight!!! Along with this bali swing is best for Instagram click!!! The driver Agus was one of the best friendly person we met in bali and he took attention to detail on serving us..Thanks Agus! we have a guide named yoyok, he's a very helpful and nice guy. he also have everything we need when we need it like face towels, water, slippers etc... the package was so nice very thrilling ang adventurous.. highly reccomended. we have a guide named yoyok, he's a very helpful and nice guy. he also have everything we need when we need it like face towels, water, slippers etc... the package was so nice very thrilling ang adventurous.. highly reccomended. Our guide was super nice! 😊 I also liked the itinerary which involved going to see pretty waterfalls, going on the swing, trying out different types of tea and coffee, going to rice field terraces as well as eating lunch at a resto situated among rice fields haha. This is recommended as a good chill day. Our guide was super nice! 😊 I also liked the itinerary which involved going to see pretty waterfalls, going on the swing, trying out different types of tea and coffee, going to rice field terraces as well as eating lunch at a resto situated among rice fields haha. This is recommended as a good chill day. We had the best time with Made as our tour guide, he was a good conversationalist and he taught us a lot of small information about Bali, overall it was a good tour! Will recommend to friends next time! We had the best time with Made as our tour guide, he was a good conversationalist and he taught us a lot of small information about Bali, overall it was a good tour! Will recommend to friends next time! This was our third day and probably the best one of all. our host and driver Mr. Aging Arya was an absolute gentleman. we really enjoyed, not just the trip but his company and the conversations we had. I want to have this trip again with the same person. This was our third day and probably the best one of all. our host and driver Mr. Aging Arya was an absolute gentleman. we really enjoyed, not just the trip but his company and the conversations we had. I want to have this trip again with the same person. Excellent experience & tour guide - Eddy! This is my first time in Bali, so grateful to have Eddy as our tour guide. Not only he shared some informative tips for the first time travelers like me, but also professional, patient, helpful and also good at photo taking! I would highly recommend all of you to join this tour, the waterfall with the sun ray is one of a kind experience! Also, the tasty coffee & tea with “insta-worthy” swing! And last but not least the wonder rice terrace. Must-go tour in Ubud! Excellent experience & tour guide - Eddy! This is my first time in Bali, so grateful to have Eddy as our tour guide. Not only he shared some informative tips for the first time travelers like me, but also professional, patient, helpful and also good at photo taking! I would highly recommend all of you to join this tour, the waterfall with the sun ray is one of a kind experience! Also, the tasty coffee & tea with “insta-worthy” swing! And last but not least the wonder rice terrace. Must-go tour in Ubud! We were picked-up by Mr. Wirar, our driver and tour guide as well. He was very informative and helpful. The tour was really great since there were only few tourist at the places we visited. Mr. Wirar also assisted me in getting my ATM card back as there was a problem with an ATM machine i had used. We were picked-up by Mr. Wirar, our driver and tour guide as well. He was very informative and helpful. The tour was really great since there were only few tourist at the places we visited. Mr. Wirar also assisted me in getting my ATM card back as there was a problem with an ATM machine i had used.